A landscape does more than just look beautiful—it embodies your own personal taste and teaches guests more about you before they even reach the front door. But in order to best showcase your connection with Mother Nature, a professional’s touch is needed to express your preferences in the most extraordinary way possible. You know the look that you like and how you want to stand out. However, in order to create the perfect landscape, you need to find a team that values your vision, and then brings it to life. Here at Topaz Design, our expertise can truly transform your home. 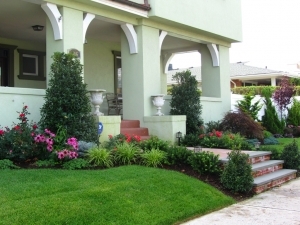 With meticulous attention to detail and a reputation for thinking outside of the box, our professional team works with you to design the landscape that you have always wanted. At Topaz, we do more than build yards—we build dreams. From beginning to end, our team provides as much assistance and guidance as you need. If you’re not entirely sure of the direction that you want to take with your landscape construction project, our designers are more than happy to share their input and expertise with you. Or, if you already have your own idea in mind, our experience and trained eye will bring your vision to fruition. No matter where you find yourself in the brainstorming process, we work with you every step of the way—from the initial consultation to the final touch. To begin your project, complete our online form today, and our team will get back to you shortly.